Select the SDK menu from the site’s top-most menu bar to open the next page. 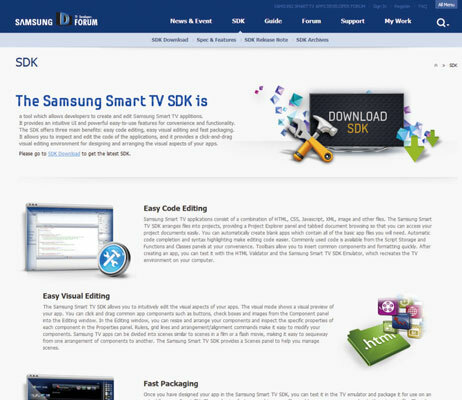 The SDK page appears on the SDF. 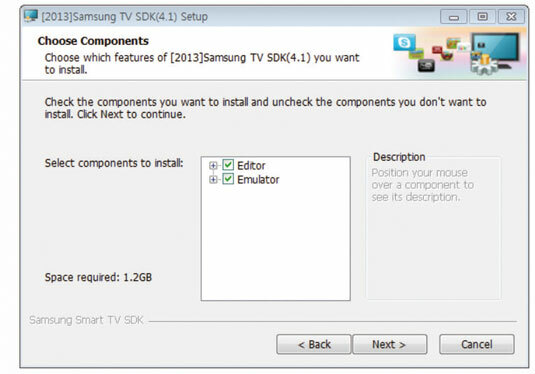 Select the SDK menu’s submenu, the SDK Download, to open the download page for the SDK. The SDK Download page provides the latest SDK 4.5 version, as well as previous versions, for Windows and other operating systems. It also provides system requirements on hardware and software for SmartTV application development, and release notes. The SDF had supported only the Windows operating system in the past, but started also supporting Linux and Mac since SDK version 4.0. However, it is still better to use the Windows version since the Linux and Mac versions have limitations on functions and APIs. The SDF also provides an Emulator image for Oracle VirtualBox to support running the Emulator on Linux and Mac operating systems, and a local cloud development environment to support collaboration of developers using multiple platforms. Click the SDK Download for Windows 7 link to download the SDK. The SDK download is a large file size because it includes an IDE. Please make sure that there is enough available hard drive space. Execute the downloaded installation file to open the installation window. Click the Next button to proceed to the next screen. Select components for the Editor, which is an IDE, and the Emulator. Select all components for now and continue the installation. Next, choose the installation folder and continue the installation. 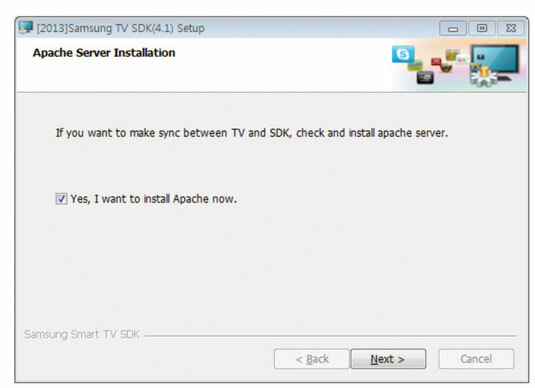 After the SDK installation is complete, continue to the Apache web server installation. Install the Apache web server, which acts as the local web server for applications to be tested. You may skip this step if an Apache web server is already installed on the PC. Access the installed SDK through the shortcut icon created on the Windows Desktop. 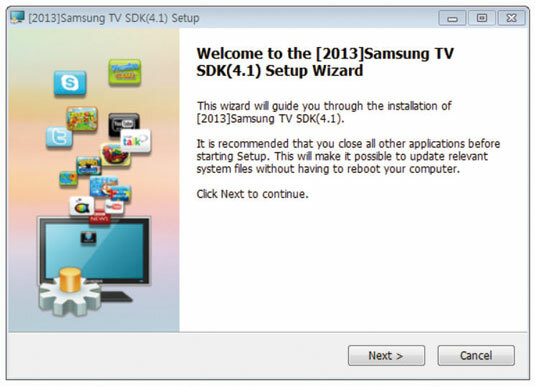 The installed SDK also can be accessed on the Windows Start menu or directly in the Samsung TV SDK 4 subfolder of the installation folder entered in Step 3.